Walking on the seashore, the gemologist felt something hard under his foot, he bent down to look. What looked like handful of pebbles, were rough, unhewn diamonds to his expert eye. He picked them up and brought them home and with patience and great skill began cleaving, sawing, cutting and polishing the pieces, the most exacting and difficult technique of lapidary art, to release their fire and luster. The finished pieces were precious jewels, reflecting brilliance through their many facets and their value was enhanced a million fold. This gemologist was Sadhu Vaswani, who transformed the lives of those who came in his contact and surrendered to his rigorous discipline. Some of them outshone the rest, and one of them was Ma Hari, his niece, the daughter of his elder brother Pahilajrai. Ma Hari is a person soaked in divinity and steeped in spiritualism. 'Hari' is the pious name of Lord Vishnu, meaning the one who takes away our troubles and tribulations. True to her name, Maa moves around in her gentle and unassuming manner radiating love and joy, giving succour to the troubled, singing praise of the Divine and enlightening people with her talks, wherever she goes. On November 26th 1915, at the time of twilight, when the radiating glow of the setting sun embraced entire nature in its loving, glowing and warm clasp, when the devotees of all religions putting aside their mundane activities, offered their evening prayers at the holy hour of Sandhya, mother Krishna brought into this world the second of her seven children, 'Hari'. Mother Krishna was a lady of great charm and beauty, liberal in her outlook and refined in her manners. Father Pahilajrai, a man of discipline and diligence rose to the status of the Administrative Officer of the Municipal Schools in Karachi. He was a great social worker. Ma grew in the atmosphere of piety and faith under the guidance of devout parents. She was closer to her mother, but it was from her father that she received the impressions that were to dominate her life. Over and above the parental impact, there was someone else in the background who captured her attention and affection, whose powerful and extraordinary imposing personality left an indelible impression on the mind of this young child. She felt deeply drawn to Sadhu T. L. Vaswani, who frequented her home and played games with the children and regaled them with stories from the scriptures and world literature. He became a Hero, whom she worshipped, as many children are wont to. He was addressed as 'Dada' by the children. Ma, as a young child was sensitive, reserved, intellectually precocious and sharply individualistic. Her mother Krishna Devi once remarked, “Of all my seven children Hari was the least troublesome.” Her father adored her, and was proud of her command over English. He would often exhibit her acumen in front of his friends by asking her to recite poems in their presence. Her early education was at St. Joseph's Convent, Karachi and she was considered one of the finest scholars at school. She was barely in her teens when her father, whom she loved and admired immensely, passed away. He was very anxious about her education and just a day before he passed away he had fondly placed her hand in the hands of his younger brother Sadhu Vaswani saying, “Do take care of Hari. See that she receives the best of education.” This was perhaps the first time she encountered grief in her life. She struggled in vain to recover her good spirits. She had not yet sufficiently recovered from the shock of the death of her father when her sister, who was older to her by two years, always gay and radiant and a constant companion, also passed away. She retreated yet deeper into the recesses of her silent self. Her mother, stricken with personal grief over the loss of her husband and the loss of her first born braced herself to support the family. These bereavements were perhaps her first encounter with death, and she became more contemplative about the deeper truths of life. The home she had loved so much seemed now an empty shell. She became increasingly detached from materialistic things and spent much time in the seclusion of her room. She learned to seek solace in writing poetry. 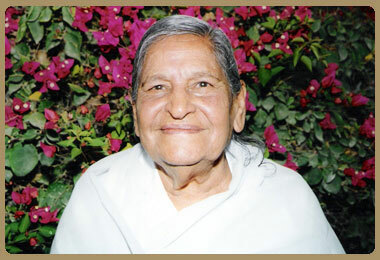 It is at this juncture that the presence of her uncle Sadhu Vaswani became a source of great solace for her. He often visited her home and talked to her about life and encouraged her to weather its storms. She spent much time in his company, imbibing his philosophy. The veil of ignorance fell from her eyes. A new understanding dawned on her. She perceived her Dada in a new light and expressed her desire to devote her life to Him. Dada counseled her to complete her studies and then reconsider her resolve. She pledged to dedicate her life to Him and waited for the day when she would be free to follow her heart's desire. At the Matriculation examination Ma topped the list of the girl candidates in Hyderabad Sindh and was honoured as 'Sindh Scholar.' She had dreamt of pursuing medicine to be able to serve the poor sick. She was vegetarian in her diet; her heart was full of compassion and love for all creation, so when on the very first day in the laboratory the demonstrator asked her to dissect a live frog, she fainted. She opted for B.Sc. and distinguished herself at College. She graduated in 1935. It is said, 'Whatever happens, happens for the best.' Even though Ma could not become a medical doctor, she eventually became a Spiritual doctor, curing masses of the materialistic malady, and restoring their spiritual health. In 1931, Sadhu Vaswani started the Mira Movement in Education in Hyderabad (Sindh) by founding Sakhi Mira School for girls. Ma graduated in 1935, and thought to herself that she was free to embark on the quest of the Divine, but fate decreed otherwise. She was expected to help her mother ease the financial straits at home. Her heat had soared in the sky and dreamt of freedom, but she still had to earn a living on earth. She went to work first as assistant at PPMC Girls School, Sukkhar. In 1936, the post of the Principal of St. Mira's High School fell vacant at Hyderabad (Sindh) and she was invited to take over the charge of the School. This school had been established by the great saint and visionary, the hero of her childhood days, Sadhu T. L. Vaswani. Though she very much disliked the drudgery of administrative duty; she could not refuse the offer, for it was the Master who had bestowed this responsibility on her. Ma graduated from studentship to Principalship. She was not happy at heart, because she was not interested in wealth or fame. So her heart experienced a void. She turned from science to spirituality, and filled this vacuum by devouring books on spirituality. 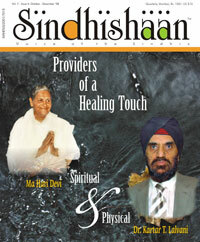 She needed a Guru who could guide her on the spiritual path; she knew her destiny was linked to Sadhu Vaswani. Ma was a born teacher. All the energy she had built up for working as missionary for her Master, could be used right here at school. Ma discovered the joy of teaching, as she taught literature and poetry. Her head was full of dreams about helping all those children who were in her charge. She believed that a stiff and formal education could dull a child's joy in learning and cripple his mind and spirit. She knew that the best in the mind of a child could only be drawn in the spirit of friendship. Only a friend can inspire love and trust. Her educational policy did not consist of any external discipline or corporal punishment. She introduced playful and joyful methods of learning - by music, dramatics and the enactment of scenes from the lives of great ones of history. She encouraged creativity in every field of learning. Although she was very young, she wore the mantle of her responsibilities with grace and charm. She was intelligent, perceptive, attentive and courteous. Her most striking qualities being humility and Naturalness. She showed no apparent signs of ambition and had not appetite for material things. The Master took personal interest in the school and its various activities and provided guidance for its working. It was his unfailing love, which provided ceaseless strength to her, and this recluse at heart, this born philosopher handled the responsibilities of a mature person, when she was barely out of her teens. He had great affection and regard for her. He frequently praised in public her simplicity, humility and sense of purity. But for her, this period was the time of intense Sadhna, i.e. spiritual discipline. Outwardly she remained completely immersed in her mundane activities, but her mind knew no rest. She yearned to be constantly near her Master, and accompany him, wherever he went. But she was duty bound. She was separated from him quite often. In the solitude of the night, she would cry out “I cannot bear to live without Thee.” She longed to dedicate herself to the quest of the Divine. But the Master in his infinite mercy was doing just the very thing which she longed for. The Master's training of this disciple differed from what he followed in the case of others. He knew she differed temperamentally, intellectually, and spiritually from the rest. Her path of evolution was through Bhakti, i.e. Devotion, and as such he enjoined austere steps for the revelation of her inborn spiritual aptitude. The Master being an anchorite was not attached to anything or anyone. Though the school was fondly referred by him as 'The Child of My Tears' yet he knew his mission was to awaken the slumbering consciousness of Humanity. He would be in Hyderabad (Sindh) for a short while, and then would be gone to Sukkar, Rohri, Shikarpur, Karachi, Lahore, Udaipur, Bombay, Madras, Kanpur, Ceylon, Calcutta, Jamshedpur or wherever the call came from. His prolonged absence from Hyderabad would render her disconsolate and very often she would burst into tears, and pass sleepless nights. But when he returned to Hyderabad, he more than made up for his absence. Then at once she was the centre of his attention and affection. His love for her was like the gushing of the spring waters, without any personal sentiments. Young and vulnerable as she was, he would show keen interest in the school and its various activities, and provide guidance for its working. Forgotten were the pangs of separation, when he would have lunch and dinner with her. He would take her out for walks, and would speak to her of poets and philosophers, narrate stirring tales. Her joy knew no bounds when he would write thoughts and poems for her. She basked in his abounding love, when he attended the school sanctuary, i.e. prayer class and addressed the staff and students. It was this formative influence of the Master which shaped Ma's character. She reached a place of spiritual consciousness from where she would reach out to the staff and students in love and sympathy. She realized that she was not to follow the common lot of a girl, i.e. marriage, children and family cycle. She conceived that a higher spiritual destiny awaited her and she lived a life of simplicity and purity. The Master would divine her intentions and encouraged her to devote more and more time to prayers and selfless service. Thought a great spiritual unrest assailed her heart, outwardly she maintained a calm appearance with her characteristics fortitude. The life of the head of the school was not any easy task. There were many gloomy and depressing moments. With faith in the Mater, she stood firm as a rock, inspiring courage and confidence among young students who had been committed to her charge by the Master. It was his unfailing love, which provided ceaseless strength to her. She plunged headlong into the whirlpool of activities of the school to fulfill the bidding of the Master. The school grew and with it grew the responsibilities. A bigger and better building was the need of the hour. It was a time of general unrest. The world was gearing up for a second World War. Against all odds, a new building was constructed. Mira School was showing commendable results under the able guidance of Ma. Public opinion suggested turning the school into an autonomous university on the lines of Tagore's Shantiniketan. But all these dreams toppled like a house of cards. In 1947, came the partition. Thousands of Hindus were uprooted from their soil, and forced to migrate to the new land, known as free India. With the general exodus, Ma too was forced to leave her hearth and home. Bidding silent adieu to her beloved school, she reached India in November 1948. Mira School was restarted in June 1950 in Poona. She was once again requested to take charge of the school but Ma had tasted the freedom of the spirit. Now she was free to sit at her Master's feet. She humbly renounced the post, yet continued to look after it till a worthy person was found. Ma had heard the call of freedom, for Ma now the goal of life was self knowledge. Like Buddha who abandoned the Royal palace, rejected earthly pleasure, and endured terrible privations, for self realization, Ma with her new gained freedom embarked in the quest of the Divine. The most powerful authority cannot enchain the heart and spirit, the voice of freedom cannot be stifled. Ma lived a life of complete anonymity. She sat there without any guise of greatness, living a hidden life with the hidden one. 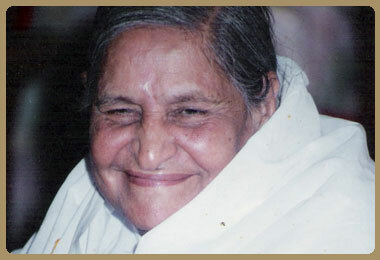 Ma's spiritual journey began when she served Mira School. The education necessary for the post of the principal came as she studied and she already had the background. The education of the heart came from the constant company with the Master. He took special care to mould her character and enjoined austere steps to spend time in meditation and prayer and service of the forsaken and forlorn. In its natural state, before it is cut and polished, a diamond is normally dull and rough, coated with crust that causes it to look like an ordinary stone. The cutting and polishing are difficult and delicate operations. Faceting causes the diamond to reflect pinpoints of light from its entire surface and gives the stone the brilliance that we admire. As long as the Master is soft, one is far from the goal of self realization. The master is like the surgeon with the knife. He wields the knife cruelly in order to be kind. This is what happened to Ma Hari Devi. When Ma stayed with the Master in Poona, the more she longed to be constantly in his company, the more she was denied the privilege and pleasure. It was the separation that worked like the knife cutting her ego to shreds and helped her evolve spiritually. She poured forth her anguish an agony in lyrics of rare beauty. She went through the furnace and emerged a sterling soul. Master once remarked “Hari is like a ray of sun – the day is not far when she will herself evolve to become sun itself.” Master had recognized the inborn spiritual potential under the outer crust and under his craft Ma emerged as a dazzling diamond. It is due to this formative influence of the Master that she reached a place of spiritual consciousness wherefrom she could reach out to people in love and sympathy. The Master's prophetic words came true. Ma is revered the world over as a saint, thought she moved in the spirit of a pilgrim spreading the message of the Master. Ma had discovered life's particular gift : service to others. And she had sought to develop it and then kept it in use. She had faced life's challenge to be useful, to make new life surroundings, and find meaning in the years that stretched ahead. Service to others had given her the feeling for the people. She served the forsaken and forlorn, and would serve them not only their needs but above all the pure love of her heart. She was interested in their smallest pleasures and pains, their trivial problems of everyday life, watching over them with affection and anxiety. After the passing away of the Master in 1966, Ma felt that the rock on which she had built the hose of her life had disappeared, and the very purpose of her existence had come to an end. She took to serving the suffering ones more and took up writing the life of the Master. Everyday and unending human stream passed through Ma's room. Most of them stayed for a while and chatted or watched in silence. It seemed that the burden of the world's joy and sorrow got poured out daily at Ma's feet. And always she listened, patiently with singular care, concern that never seemed to wane. For each and everyone she had some affectionate word, a smile or a maternal caress, and the gift of her total attention. She served in silent secrecy, to those who were in need. She was always willing to do things for people. It was never announced or advertised. Her innate goodness came out through acts of kindness and compassion. No one was rejected or overlooked and one felt at home. It was remarkable that despite the large number of visitors everyone left with the impression that Ma kept a special space in her heart for him or her alone. Ma was a literary creative person. Whatever she wrote, was not for pleasure or entertainment, not for name or many but due to her spontaneous outburst of her spiritual urge. Ma was a great poetess. The poetry gushed forth from her pen. Her poems were the spontaneous and deeply moving expressions of the soul's adoration for the almighty. They were not composed as conscious effort, but a cry of pain and agony at the separation from the beloved. Ma's writings are of great diversity and depth. Her aesthetic sense was not confined to merely her works of literature, but pervaded her whole mode of conduct. Her extremely delicate sense of fairness, of right and wrong, of good and bad, was not derived so much from the study of books on ethics or religion as from the innate aesthetic faculty which was in tune with truth and goodness and beauty. She was a well read person. But she returned again and again to the world scriptures. She quoted from the Bible, the Koran, the great epics Ramayana and Mahabharata, from the Sikh scriptures and from the Dhammapada. She had an extraordinary capacity of narrating profound truth in a simple story form or maxims. Over a score of books flowed from her pen. 'Seeking God', 'Saint of Modern India', 'Pathway to Paradise', 'Way to Heaven', to just name a few. Her book 'A Saint of Modern India', comprising a full biography of Sadhu Vaswani has been much applauded. Ma was an outstanding orator. She would stand with a radiant smile and easy speech. She had a melodious voice and captivating style. The resonant tone of her voice lingered in the memory of her listeners long after they had heard her. She spoke slowly, enunciating words carefully. It was the way of a writer who knows the value of words with precision and exactness. Ma was invited by her devotees to deliver discourses to guide them on the spiritual path. She had headed many a conference and gathering in various parts of India and abroad. She moved around in her gentle and unassuming manner, enlightening people, and spreading the message of love Divine. She was able to modulate her voce according to the area occupied by audience. The person on the fringes of the crowd heard her as distinctly as the person next to her, and the melody was such that at its height the voice was set to those near her as those far away. Whether the audience was large of small, she always spoke with the same seriousness and purpose and eloquence of expression. Her best lectures were all carefully thought out, almost prepared beforehand. She never carried any notes. She never consulted any papers as she spoke. Her memory remained remarkable and she never faltered for a word and her voice never broke. Although advanced in years she was wonderfully alert in her mind. In her life Ma had a fair quota of ups and downs. But never in all years did she lost her nerve. Whatever the difficulties and obstacles, she met them with courage and ceaseless efforts. She remained sprightly, ardent and assiduous. Soon after her eightieth birthday, Ma reused invitations to address any gatherings or travel out of Poona. Most of her time she spent in her austere room. She rarely stepped out of her room except to visit the Master's shrine at the twilight hour. There she sat in silent meditation for over an hour and retreated back to her room. She spent hours at a time on her cot in silence or in light talk, as people filed by to offer their respects. She said the time had come to 'Return to oneself'. She remarked that the edge of eighties was not reached without some reminder that the body is not the permanent habitation. She was ready for death. She said, “I have lived my life well, I have no regrets. When death comes, it will be all right. I think I will know when it draws near. I will drop everything and go”. I had seen her across the years. The same yet in a way better, for life's burnishing process always improves when the material to be worked is sound. She was ever smiling. Her hair streaked with gray, her brown eyes warm as ever, her figure draped in white cotton sari. Ma, till the last contributed to life. Keeping her faculties in full exercise was perhaps the secret of her good health and longevity. Her great age sat upon her lightly. Yet steadily through her influence the lives of many are being transformed and a small flame is lit in thousands of hearts. Ironically the very person, who had walked alone all through life, draws multitudes around her. The lone figure affects majority of followers. Literary a fortnight before passing away she had predicted her death to her attendants by showing with one hand opening and closing the fingers three times to indicate she had a fortnight more to go. Her last words a week before she was admitted to the hospital for her breathing problem were, “Dada Ka bulava aya hai, Kanha ke ghar jana hai.” i.e. The Master's call has come, I have to return to the land of Krishna. When I went to see her the next day at the hospital, she was in the ICU unit totally strapped to a battery of life support system, with tubes and wires attached to her body. Two oscilloscopes across whose screens danced the rhythmic impulses of the vital signs of Ma. Irrespective of being in the strange atmosphere of the hospital, along with strange faces of Doctors and nurses attending to her she looked a picture of peace and tranquility. Minimum visitors were permitted to see her, that too for a few seconds. I was one of the lucky ones, permitted within. The moment she saw me, she signaled me to come near and laid her hand on my head in blessing. Even on her death bed she saw my need to be consoled. The most important lesson that I learnt from this behaviour of Ma 'That for her the living had priority over her own death.' If you are fortunate enough to have some prior warning you get a final chance to grow and become truly who your really are, and to become more fully human. I vacillate to say anything about a person like Ma. The unexpressed will always remain more impressive than the expressed. Mind you, she was just the tip of an iceberg that manifests itself above water, the greatest part being submerged in the ocean. She was too mighty to be captured in words or expressed in oration. For an average person like me, she was a bundle of contrasts. So simple yet so dignified, so silent yet so eloquent, so modest yet so outstanding, so divine yet so approachable. She emanates an aura of love. All anxieties, fears and worries seem to melt away the moment you are in her presence. When you look at her face, you know you have had a glimpse of Divinity. The great pilgrimage on earth ended on 13th June 2007, and in this life it lasted for 92 years. With a smile on her lips and God realization in ageless eyes she bid adieu to this world. Now she is Free as earth, free as air, now she doth travel everywhere.